jwalsh @13, it would be nice if you in fact let the IPCC explain, rather than cutting them of in mid explanation. To start with, as shown in Fig 10.4 below, the models are used to determine relative contribution but are scaled to match actual temperature increases. Thus if a model shows an anthropogenic temperature increase of 0.8 C, and a total increase of 0.7 C, then the anthropogenic increase is scaled by 0.65/0.7 to determine the anthropogenic contribution. Thus any tendency to over estimate the temperature trend is eliminated as a factor in determining attribution. All that remains is the relative responsiveness to particular forcings. With respect to that, it is well known that the combined natural forcings from 1951-2010 are slightly negative, or neutral at best. on by scaling in any event. Yes, it goes on into further detail. But I fundamentally stand by my orginal assessment. The 10.5 graph was primarily derivative of a very small group of papers discussing model outputs. Therefore, I think a statement like “The green bar shows the amount of warming caused by human greenhouse gas emissions during that time.” is potentially misleading. The green bar is derived from climate model outputs. And I don’t think “while Judith Curry from Georgia Tech represented the opinions of 2–4% of climate experts that we could be responsible for less than half of that warming.” is well supported by evidence, or the IPCC here. In the same section, they go on to say that.. Very Likely, in IPCC parlance, is 90-100%. And that’s if you agree with their conclusions there. And not every climate scientist does. But I certainly wouldn’t want anyone to take my word for it. Verheggen et al. 2014 asked a number of climate scientists to provide a figure for attribution and roughly 2/3 rds reported above 50% anthropogenic. The remainder either less or uncertain. Setting aside method criticisms for the paper itself (close enough for this purpose), how does one reconcile this to the 2-4% estimate? For that matter, where does 2-4% come from? Not from any study I have read. Were too many climate scientists unaware of the CMIP5 and other model(s) results? For his part, Schmidt referenced the most recent IPCC report. The IPCC summarises the latest and greatest climate science research, so there is no better single source. The figure below from the IPCC report illustrates why 96–97% of climate science experts and peer-reviewed research agree that humans are the main cause of global warming. The probability density function for the fraction of warming attributable to human activity (derived from Fig. 10.5 in IPCC AR5). The bulk of the probability is far to the right of the “50%” line, and the peak is around 110%.If you are still here, I should be clear that this post is focused on a specific claim Judith Curry has recently blogged about supporting a “50-50? attribution (i.e. 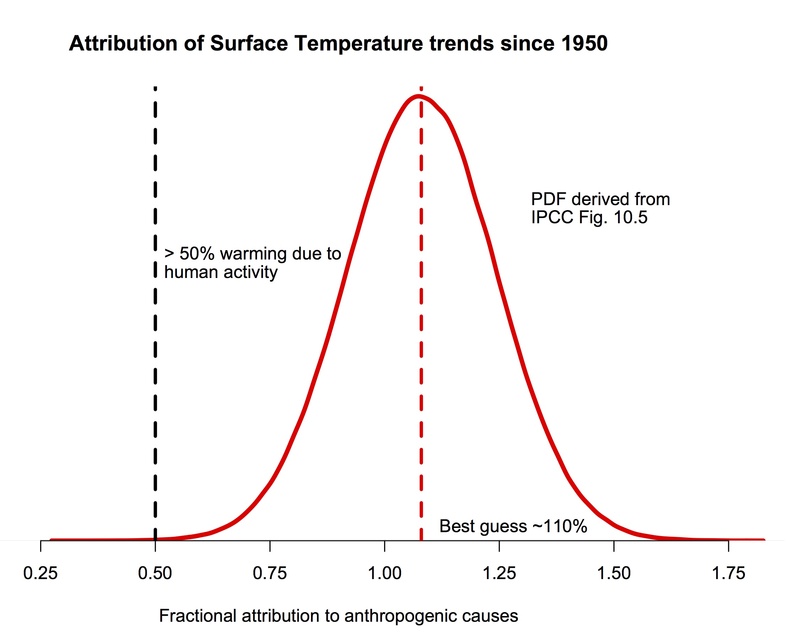 that trends since the middle of the 20th Century are 50% human-caused, and 50% natural, a position that would center her pdf at 0.5 in the figure above). She also commented about her puzzlement about why other scientists don’t agree with her. Reading over her arguments in detail, I find very little to recommend them, and perhaps the reasoning for this will be interesting for readers. So, here follows a line-by-line commentary on her recent post. Please excuse the length. G Is expert judgment about the structural uncertainties in a statistical procedure associated with various assumptions that need to be made different from ‘making things up’? Actually, yes – it is. 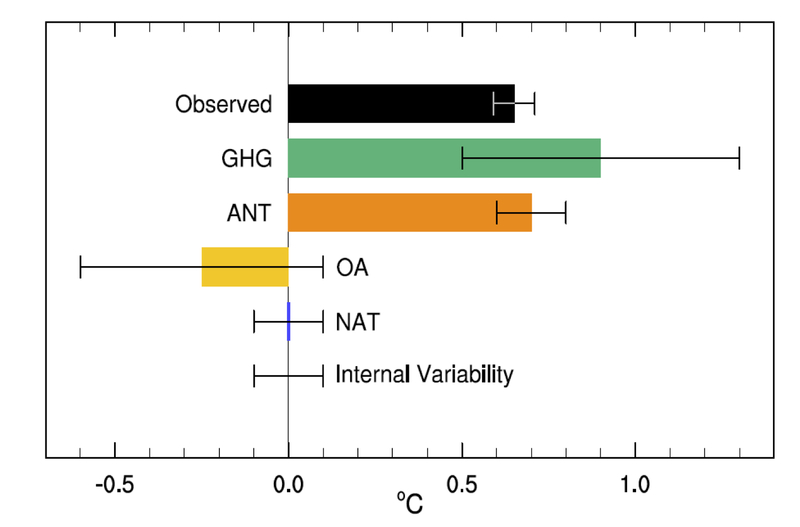 The best estimate of the warming due to anthropogenic forcings (ANT) is the orange bar (noting the 1???? uncertainties). Reading off the graph, it is 0.7±0.2ºC (5-95%) with the observed warming 0.65±0.06 (5-95%). The attribution then follows as having a mean of ~110%, with a 5-95% range of 80–130%. This easily justifies the IPCC claims of having a mean near 100%, and a very low likelihood of the attribution being less than 50% (p < 0.0001!). Note there is no ‘downweighting’ of any argument here – both statements are true given the numerical distribution. However, there must be some expert judgement to assess what potential structural errors might exist in the procedure. For instance, the assumption that fingerprint patterns are linearly additive, or uncertainties in the pattern because of deficiencies in the forcings or models etc. In the absence of any reason to think that the attribution procedure is biased (and Judith offers none), structural uncertainties will only serve to expand the spread. Note that one would need to expand the uncertainties by a factor of 3 in both directions to contradict the first part of the IPCC statement. That seems unlikely in the absence of any demonstration of some huge missing factors. I gave a basic attribution for the 1910-1940 period above. The 1940-1975 average trend in the CMIP5 ensemble is -0.01ºC/decade (range -0.2 to 0.1ºC/decade), compared to -0.003 to -0.03ºC/decade in the observations and are therefore a reasonable fit. The GHG driven trends for this period are ~0.1ºC/decade, implying that there is a roughly opposite forcing coming from aerosols and volcanoes in the ensemble.
? NATURAL VARIABILITY AS WELL? The situation post-1998 is a little different because of the CMIP5 design, and ongoing reevaluations of recent forcings (Schmidt et al, 2014;Huber and Knutti, 2014). Better information about ocean heat content is also available to help there, but this is still a work in progress and is a great example of why it is harder to attribute changes over small time periods. In the GCMs, the importance of internal variability to the trend decreases as a function of time. For 30 year trends, internal variations can have a ±0.12ºC/decade or so impact on trends, for 60 year trends, closer to ±0.08ºC/decade. 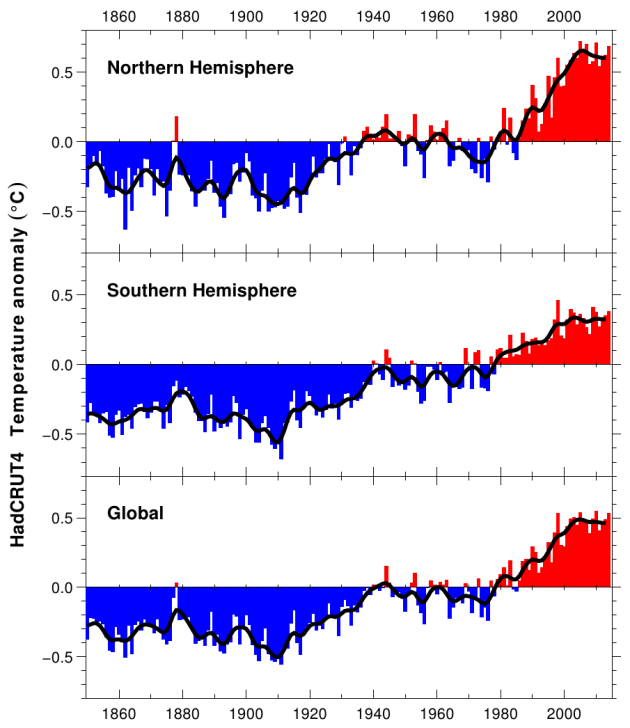 For an expected anthropogenic trend of around 0.2ºC/decade, the signal will be clearer over the longer term. Thus cutting down the period to ever-shorter periods of years increases the challenges and one can end up simply cherry picking the noise instead of seeing the signal. by Judith Curry Pick one:a) Warming since 1950 is predominantly (more than 50%) caused by humans.b) Warming since 1950 is predominantly caused by natural processes. When faced with a choice between a) and b), I respond: ‘I can’t choose, since i think the most likely split between natural and anthropogenic causes to recent global warming is about 50-50?. Gavin thinks I’m ‘making things up’, so I promised yet another post on this topic. The issue here is of the likelihood of human induced CO2 production causing the global warming detected from 1950 to 2014. The basis of this argument is that CO2 increasing at 1.3 ppm a year [2.07 for last decade] from a base of 312 to now 400 PPM is all human induced and that this should cause a rise in average global temperature of 0.2 degrees a decade. The attribution of the warming is made from assumptions [G and Curry] from models and the models are all programmed to input 0.2 degrees rise a decade [the rise that “must “occur when CO2 is going up at this rate”]. ” the climate models ‘detect’ AGW by comparing natural forcing simulations with anthropogenically forced simulations. Firstly anthropogenic global warming is really GHG [greenhouse gas] warming as humans are supposed to make all of the excess GHG. This is a lot more than the observed warming over this time as 0.2 degrees a decade for 64 years is 1.28 degrees. Strangely this is 130% of the observed warming that has occured, Guess the models did not predict the pause after all. Secondly CO2 levels are increasing per decade from 0.75 ppm to 2.07 ppm but the models were set with the lower levels. At the same time as we should be seeing an increase in temperature rise we instead have a pause. Thirdly anthropogenic global warming [ANT] is still put at greater than 100%, ie 110 %, after taking off the supposed negative aerosol effect [OA], which is so unknown that the error bars are bigger than the guesstimate.This is where Gavin obtains his 110% likely range of Anthropogenic warming that he attributes to the IPCC. This is 1.28 degrees minus largest guesstimate with a straight face for aerosol effect.